Gatttool, ubuntu, and Adafruit’s Bluefruit LE – NRF8001 Bluetooth low energy breakout in 20 minutes « Adafruit Industries – Makers, hackers, artists, designers and engineers! Thanks to Nancy for sending in her tutorial from her blog orange narwhals. Check out more here. As part of my work on Swarmbuddies (robots that dance to music and create formations) we decided to use bluetooth low energy for smartphone support, but also needed it to work on the desktop side for our computer vision software to work. 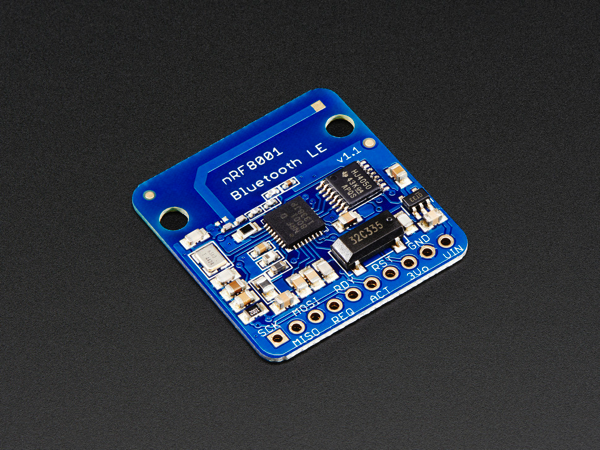 Bluefruit LE – Bluetooth Low Energy (BLE 4.0) – nRF8001 Breakout: Our Adafruit Bluefruit LE (Bluetooth Smart, Bluetooth Low Energy, Bluetooth 4.0) nRF8001 Breakout allows you to establish an easy to use wireless link between your Arduino and any compatible iOS or Android (4.3+) device. It works by simulating a UART device beneath the surface, sending ASCII data back and forth between the devices, letting you decide what data to send and what to do with it on either end of the connection. Read more. This was very helpful, if you do not have an iOS od Android device availble.